That one runs $345.oo at MSRP. Peter Millar also has belts for other budgets for those that don’t want to spend that kind of cheese. Their collegiate logo belts are awesome if you’re one to want to support your alma mater. That’s a great look. Not every school is available due to licensing agreements. 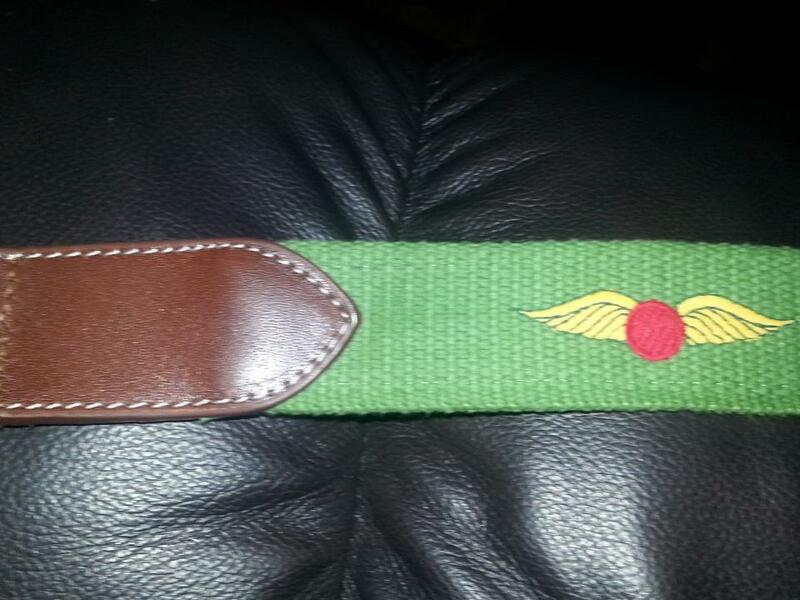 My favorite of the PM selection is probably the line of course logo belts they offer. You won’t find the course logo belts on the Peter Millar site, at least I couldn’t, but they are available in select proshops and via J.T. Spencer (see below). This is the version I have with the famed Baltusrol logo on it. It is probably my favorite new addition to my golf wardrobe. See all the styles at the Peter Millar website. If you’re like me, you like your gear to be unique, and you want to use it to express yourself on the golf course. One can find more customization and as high of quality product with J.T. Spencer. Have your heard of J.T. Spencer? Perhaps not as the product line is fairly new. About four years ago J.T. found himself eyeing an embroidered belt in the Pinehurst golf shop. It was excessively expensive and not made in the United States. Like any good golfing patriot, J.T.refused to pay that kind of dough for foreign merchandise and created his own product line. A click on the link above will show you more of what J.T. Spencer has to offer. The belts are just like the Peter Millar embroided belts I’ve already showed you. They are very high quality with more customization options than you can think of. Corporate logos, course logos, school logos, palm trees, cocktails, fish….you name it, they can do it. They’ll even customize the label to have your own golf shop shown. I picked up one of these a few weeks ago just to add a splash of color to my belt game. Both the Peter Millar and JT Spencer embroidered belts retail at about $85. I’ve been very satisfied with the ones I have. In fact, I think its become an addiction as I can’t wait to go buy my next one. **ShutFaceGolf is not in any way affiliated with Peter Millar or J.T. Spencer, nor has any endorsement of this product been paid for by either company. The views expressed in this post are solely from the author and publisher of ShutFaceGolf.com. In other words, I just really like the belts. I hope you do to. Enjoy! This entry was posted in Equipment, Style and tagged Belts, customization, disclaimer, JT Spencer, Peter Millar, style. Bookmark the permalink. Gotta go with Rory. I think the last two MC’s were just a result of lack of mental preparation/focus. I think he is all in and prepared, and as we all know, he has an extra gear that separates him from the field(when he can find it). I’m pulling for Spieth, but I think this one is Rory’s to lose.